The 2018-2019 Midwest Book Awards Call For Entries is now closed! Thank you for your submissions, and the list of finalists is now available! SAINT PAUL, MN, April 17, 2019: The Midwest Independent Publishing Association (MIPA) has announced the finalists for the 29th Annual Midwest Book Awards. The awards recognize quality in independent publishing in the Midwest. All books were copyrighted in 2018 and entered by publishers from MIPA’s 12-state Midwestern region (Illinois, Indiana, Iowa, Kansas, Michigan, Minnesota, Missouri, Nebraska, North Dakota, Ohio, South Dakota, and Wisconsin). Winners will be announced on Saturday, May 4, 2019, at the Midwest Book Awards Gala in Saint Paul. Congratulations to the following finalists! *Books entered must meet a minimum score to be a Finalist: not every category has a Finalist. Dorothy Molstad’s marketing and public relations talents won accolades at West Publishing and then Waldman House Press, where she got its best-selling PEEF the Christmas Bear book character into a movie and as a parade float. At Voyageur Press (Motorbooks International), the international publicity earned for its Snowflake books resulted in a feature story in Better Homes and Gardens, an appearance on the Martha Stewart Show, and even a US postage stamp. As a private consultant she instituted the Author on the Rise program for Panera Bread and helped dozens of authors individually with signings, book tours, and radio and TV appearances. She taught media-training skills, marketing and PR techniques nationally and as a founding partner of Book Architects helped even more authors with their manuscripts and ideas on how to market their books. In 2010, MIPA awarded the first Pat Bell Award in honor of a woman who, for many years, was the rock of the organization and a long-time board member. On the phone, by email, or during meetings, Pat Bell patiently answered the many questions posed by MIPA members and others curious about publishing. Pat Bell embraced the Internet early on, and soon her mentorship extended nationwide through chat rooms and user lists. Publishers Marketing Association (PMA) — now IBPA, Independent Book Publishers Association, a national organization of independent publishers—recognized her expertise. She was asked to serve on its board and became a major national advocate for independent publishers. Publishers based in the Midwest are invited to enter the 29th Annual Midwest Book Awards competition for excellence in books published in 2018. The awards recognize creativity in content and execution, overall book quality, and the book’s unique contribution to its subject area. All entries MUST carry a 2018 copyright and an ISBN. If an entry has a 2019 copyright date, documentation must be provided showing the book was released in 2018. There are no exceptions. Entries must be published by publishers located in the 12-state region: Illinois, Indiana, Iowa, Kansas, Michigan, Minnesota, Missouri, Nebraska, North Dakota, Ohio, South Dakota, and Wisconsin. A single title may be entered in up to three (3) categories. Only print books may be entered. No eBook or app submissions will be accepted. Deadline for receipt of books and entry fees is December 31, 2018. There are absolutely no exceptions. Three (3) finalists are selected in each category. From those, one (1) winner is chosen. Finalists and award winners receive certificates and tickets to the Midwest Book Awards Gala. Winners will also each receive a bronze medallion. 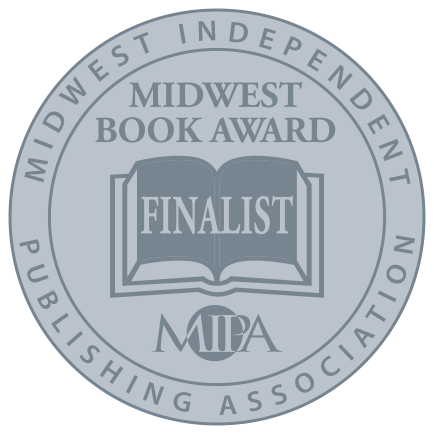 Both finalists and winners may purchase foil seals for use in marketing efforts and will be featured in the Midwest Book Awards Gala Program, in MIPA press releases, and on the MIPA website. Judges’ individual book evaluation sheets will be provided to all entrants after the awards are announced. Awards will be presented at the Midwest Book Awards Gala in May 2019 in Saint Paul, MN. Each entry will be judged by three independent judges. Finalists are determined by totaling the scores from all three judges. The winning entry is the title with the top score. The judges’ decisions are final. Please note: If the entries in a category do not meet the standards for quality as set by the Midwest Book Awards, no award will be given in that category for that year. See Judging tab for more information about judging criteria. Questions: Contact Verlene Birger by email or call 605.366.9894. Entry Form: Send a copy of the completed entry form for each title. Entry forms may be photocopied or may be printed from the MIPA website, www.MIPA.org. Please do not use staples, tape, or glue. Where to Send All books and entry fees must be POSTMARKED by December 31, 2018. You will receive an email confirming receipt of your submissions. Ship books, entry form, and entry fees in the same package to: Midwest Book Awards Attn: Verlene Birger 1004 Tanner Court Tea, South Dakota 57064 Questions: Contact Verlene Birger by email or call 605.366.9894. Each entry will be judged by three independent judges. Judges’ individual book evaluation sheets will be provided to all entrants after the awards are announced. Judges assign a numerical score to each question. They are invited to—but not required to—offer additional comments, observations, and suggestions. Numerical scores decide the finalists and winners. Comments are purely for the benefit of the publisher. One of the goals of MIPA is to help publishers produce quality books and learn best practices in the industry. We encourage you to look over the judging information listed below to get an idea of the areas on which your entry will be evaluated. Writing: Is the writing style engaging and the voice consistent? How well does the text follow generally accepted principles of good writing for the genre (i.e., clear sentence structure, use of active voice, strong vocabulary)? Mechanics/Organization: Rate the mechanical correctness of the copy regarding grammar, spelling, punctuation. Is the content well organized and does it flow easily to allow comprehension and maintain interest (pace) by the intended reader audience? Clarity/Storytelling: For fiction, is the plot engaging and original? Are characters appropriately developed? For nonfiction, is the information well presented and organized clearly? Is the topic compelling? For children’s books, is the story interesting and is the writing appropriate for the age level? Production: Rate the production quality of the book (formatting, consistency in design, printing quality). Overall Reaction: Rate your overall impression of the content and quality of the book. The design criteria used for evaluating entries in cover design, interior design, illustration—graphic, and total book design include the following questions. These questions are fine-tuned for the specific category. For example, cover design judges will only receive questions pertaining to cover design. Cover Appearance: Does the total cover design create interest—do you want to pick up the book and examine it more closely? Does the cover fit the genre? Are the photographs or illustrations appropriate, of good quality, and reproduced well? Does the choice of color on the cover stimulate interest and fit with the subject? Cover Layout: Is the typeface attractive, readable, and appropriate for the subject matter? Does the organization of cover elements create a coherent look? Are front and spine copy legible in all formats (i.e., bookstore shelves and online thumbnails)? Interior Appearance: Is the book layout (i.e., the organization of heads, subheads, indents, and breaks in copy) consistent and does it facilitate reading? Are font styles and typographic composition easy to read and complementary to each other? Interior Layout: Are margins well spaced? Do the letter, line, and word spacing create a pleasing reading experience? Is the printing well done throughout and does the paper stock fit the book’s design? If there are illustrations or photographs in the interior, are they appropriate, of good quality, and reproduced well? Overall Reaction: Rate your overall impression of the design of the book. The publisher selects one or more categories in which to enter each book. A single title may be entered in up to three (3) categories. Only print books may be entered. No eBook or app submissions will be accepted. Arts/Photography/Coffee Table Books: Books about the graphic and performing arts, architecture, and photography. Coffee table books created for display that meld exemplary text, design, and artwork. Autobiography/Memoir: Nonfiction and creative nonfiction about the author. Biography: Nonfiction books about a current or historical figure (not the author). Business: Business-related literature including commerce, career, computers, technology. Children’s Fiction: Fiction books aimed at all reading levels to age twelve. Children’s Nonfiction: Nonfiction books aimed at all reading levels to age twelve. Children’s Picture Books: Books for children with a substantial amount of artwork. Young Adult Fiction: Fiction, whether or not genre specific, aimed at the teen market. Young Adult Nonfiction: Nonfiction, regardless of subject matter, aimed at the teen market. Cookbooks/Crafts/Hobbies: Books on all cooking-related topics, crafts, and hobbies aimed at adults. Education/Learning: Books aimed at adults on topics of education, including homeschooling. Family/Parenting: Books aimed at adults on all aspects of family life, including parenting help, family dynamics, and multigeneration families. Fiction — Fantasy/SciFi/Horror/Paranormal: Genre fiction with a fantasy, science fiction, horror, or paranormal theme. Fiction — Literary/Contemporary/Historical: Fiction that focuses on character development, plot depth, and writing style as well as genre fiction with a historical theme and historical setting. Fiction — Mystery/Thriller: Genre fiction with a suspense or mystery theme. Fiction — Romance: Genre fiction with a romance theme. Fiction — Short Story/Anthology: Collections of fiction by one or by multiple authors. Health: Nonfiction books aimed at adults with topics related to health and healing, including physical and mental health, addiction, and alternative medicine. History — General: Nonfiction books with subjects of a historical nature. Humor: Fiction and nonfiction books whose primary focus is humor. Inspiration: Nonfiction books focused on personal development and improvement. Nature: Nonfiction books relating to nature, ecology, and environment. May include essays on these topics. Poetry: Poetic works, whether by one author or an anthology. Recreation/Sports/Travel: Nonfiction books with a sports, recreation, or travel theme, including travel guides and travel essays. Religion/Philosophy: Nonfiction books encompassing all religions — Eastern, Western, and New Age — as well as philosophy. Social Science/Political Science/Culture: Nonfiction books aimed at adults with an emphasis on the social sciences, political issues, current events, and cultural issues such as diversity, gender, sexuality, and aging. Cover Design: Covers that are compelling, effective, and fit the topic and/or genre. Interior Design: Overall interior book design and production that excels in quality. Illustration — Graphic: Books with extensive interior artwork, not including photography. Usually entries in this category are children’s picture books. Total Book Design: Total book design, including interior layout and cover design. Questions? Midwest Book Awards Chair Verlene Birger can answer your questions and provide guidance if you are not sure how to choose the specific categories that could be appropriate for your book in the Midwest Book Awards program. Contact Verlene Birger by email or call 605-366-9894. Questions? Contact Verlene Birger by email or call 605.366.9894. Publishers based in the Midwest are invited to enter the 29th Annual Midwest Book Awards competition for excellence in books published during the 2018 calendar year. The awards recognize creativity in content and execution, overall book quality, and the book’s unique contribution to its subject area. The Midwest Independent Publishing Association (MIPA) has sponsored the book awards since 1990. Midwest Book Awards honor the publishers in the 12-state Midwest publishing community who are producing quality work. Award recognition helps publishers and authors succeed in today’s competitive publishing industry. Gold (winner) and silver (finalist) award seals are available for purchase to qualifying authors and publishers. These seals are foil stamped and are great promotional tools.